Where do I use my Dobies voucher code? Dobies are proud to have been awarded the coveted "Best Buy" Seed Supplier by Which? Gardening with "an impressive 91% of seeds producing healthy seedlings. 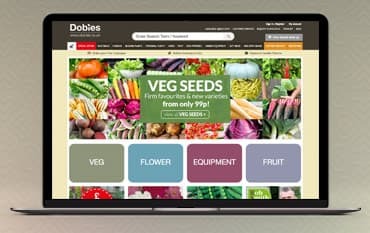 Not only do Dobies offer a huge selection of seeds they also provide seasonal vegetables, flowers, bedding plants, perennial plants, herbs, fruit, seed potatoes, garden equipment and gift ideas. So whether you’re looking for carrot seeds, container plants, mustard seeds, garden tools, pest control, compost, pond accessories or anything else you can find it at Dobies. As well as all this you can also find a helpful blog page, useful gardening articles, growing guides and a garden planner, so you can always be organised and in the know about what you should be planting every month of the year. You can also find a garden gift ideas range, perfect if you have a gardening enthusiast to buy for as well as the Rob Smith Heritage range and the keeping chickens section. As well as a great selection of plants and garden accessories Dobies also boasts an impressive ‘keeping chickens’ section. If you own chickens or are thinking of getting some then this section is the perfect place for you. Discover coops, fencing, fertilised eggs, incubators, brooders, seeds collections, feed, supplements, feeders, drinkers, health and hygiene products, egg boxes, chicken accessories, chicken gifts and starter kits. On top of all this, there’s also plenty of chicken information available to help you get clued up on everything from chicken care to chicken food. At Dobies, you’ll find a Rob Smith heritage collection full of great products and accessories. Rob Smith is the winner of the BBC Big Allotment Challenge and has a great supply of cut flowers, vegetables, fruit and garden tools available at Dobies, all of which are of the highest quality. Browse through each section and find an array of products that are updated regularly including cornflowers, sunflowers, tiger nuts, tomato seeds, strawberry plants, apple trees, spades, digging forks and much more. All of the products in this range are incredibly affordable, allowing you to keep your garden up to scratch for less. In the special offers section, you’ll find tons of great percentage discounts and multi-buy deals to help you save on your gardening order. With deals like 50% off onions, 6 for £15 on Primula Vulgaris, £5 off Pink Crispy plants, 50% off the plug plant collection, 49% off grafted veg and 72% off spring bedding plants, you are sure to save money on all your gardening supplies. With price reductions on flowers, vegetables, fruit, equipment, trees and shrubs there’s always a way to save money at Dobies. Orders to Mainland UK: If you are ordering packet seed, garlic, onion sets or shallots the delivery charge is just £1.99 for the entire order. If you are ordering anything else, the carriage charge is £4.99. You only pay one or the other and this charge is per order, irrespective of how many items you order. If you are dissatisfied in any way with Dobies’ products please let them know within 14 days and they’ll arrange a replacement or a refund. Dobies have been supplying flower and vegetable seeds direct to gardeners in the UK since 1880. In addition to seeds, Dobies also offer the largest range of young annual plants available by post, as well as bulbs, fruit and garden equipment. Whether you’re looking for bedding plants, herbs, seed potatoes, perennial plants or more you can find it all at Dobies alongside special offers and great deals. To save money on your order you can also shop online with one of our Dobies voucher codes and request one of their annual catalogues to find all the best products for less.